Alternative therapies offer treatment for all complaints, from circulation and digestive problems to depression and stress. There is strong scientific evidence that some, such as acupuncture, work. However, some experts say the evidence for other forms, such as homoeopathy, is at best sketchy. There are a wide range of different complementary therapies. Here, we give details of some of the most widely practised. Acupuncture: An ancient Chinese art based on the theory that Qi energy flows along meridians in the body, and can be stimulated by inserting fine needles at specific points. Acupuncture is used to treat asthma, addiction, arthritis, depression, anxiety, blood pressure disorder and problems with the digestive system. There are a wide range of studies demonstrating that acupuncture has a positive effect, including evidence to suggest it works by deactivating pain centres in the brain. However, other research has suggested "sham" acupuncture - where someone only thinks the needles are being inserted - can also benefit patients. Aromatherapy: The use of essential oils in treatments to improve physical and emotional well being, relieve pain and alleviate tension and fatigue. Each aromatic oil, extracted from different parts of plants, is thought to have unique therapeutic properties. They can be added to a bath, massaged through the skin, inhaled directly, used with teas, or scented in a room. A German study found that water had the same effect as expensive oils - as long as patients believed they were being given the real thing. However, a Nottingham hospital is offering aromatherapy to help mothers-to-be cope with the pain during labour. Crystal Healing: The use of crystals, gemstones and minerals in several ways to amplify and accelerate the self-healing processes within the individual patient. The theory is that healing can be speeded up by the interaction between the vibrational structure of the crystalline matter and the bio-magnetic energy patterns within the human body. Herbal Medicine: It is believed that as much as 80% of the world outside the industrialised countries relies on herbs for health. In fact, many commercially produced pharmaceutical products are derived from herbs, but herbal medicine uses the whole plant rather than an extract. Herbal medicines are used to help most illnesses including migraine, arthritis, depression, insomnia and lung, stomach, blood and skin disorders. Homoeopathy: This works on the principle that what makes a healthy person unwell can be used to treat the same symptoms in someone who is unwell. But homoeopathic medicines are diluted to a high degree. They are used on asthma, allergies, anxiety, tension, menstrual problems and morning sickness. A Swiss-UK review of 110 trials published in The Lancet in August 2005 found no convincing evidence the treatment worked any better than a placebo. But a six-year study at Bristol Homoeopathic Hospital found over 70% of patients with chronic diseases reported positive health changes after treatment. 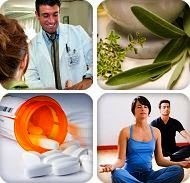 Hypnotherapy: A method designed to induce relaxation to relieve certain symptoms or bring about a change in life style. It combines the skills of counselling and psychotherapy with the techniques of hypnosis. The induction of hypnosis produces an altered state of consciousness or awareness, similar to day dreaming or near-sleep. A small study published in the journal Gut in April 2006 found hypnotherapy could help relieve severe chest pain not caused by a heart condition. Magnet Therapy: The use of magnets to help relieve muscular aches and pains, insomnia, headaches, and poor bladder control. It has also been claimed that the technique can have a positive effect on more serious conditions, such as cancer and circulatory diseases. The therapy is controversial, and is not advised for people having radiotherapy treatment, or those who wear a pacemaker. A British Medical Journal study, published in January 2006, found that magnets had no effect. Massage Therapy: The manipulation of soft tissue for therapeutic purposes, which may include the use of oil, salt glows, and hot and cold packs. Designed to create a state of being both relaxed and alert, relief from stress, faster recovery time from an injury, and a greater sense of self-awareness. Osteopathy: A widely respected therapy which also has a regulatory council. Osteopaths manipulate the muscles and spine to improve mobility and balance. It can help with many types of injury and be useful in treating arthritis, sciatica, headaches, depression and digestion problems. Reiki: A technique developed in Japan which aims to promote the body's own capacity to heal itself. The practitioner gently places his hands in specific positions on the body. It is based on the belief that, by channelling spiritual energy through the practitioner, the spirit is healed, and the spirit, in turn, heals the physical body. Reflexology: A type of deep foot or hand massage designed to relax the whole body through the reflex response. The thumbs are used extensively to break up crystalline deposits which have formed at the nerve endings, particularly on the bottom of the feet. There is some research to suggest that therapy can have beneficial effects, particularly on kidney and intestinal function. Shiatsu: Shiatsu means finger, or thumb pressure. Like acupuncture, it is based on the theory that meridians, or lines, of energy run through the body, and can be manipulated. Techniques include pounding, stretching and rocking. Pressure may be applied by use of forearms, elbows, palms, feet and knees. The end result should be greater mobility and flexibility, a clearer sense of one's body, and a sense of being both relaxed and energised. Yoga: Has been shown to alleviate stress and, at the physical level, yoga has been seen to be useful in the treatment of those who suffer conditions that affect or are affected by posture, such as backache and arthritis.